In our last article, we outlined why coming up with words relevant to your website helps your SEO strategy. Now let’s focus on how to do a thorough keyword research from scratch. What Your Website Ranks for? For starters, you need to know what keywords your site ranks for already. Of course, this will work only if you’ve been running the website for some time. Visiting Google’s Search console will make it easier for you. There’s a report called Search Analytics, where you can see the keywords and their impressions and clicks. Before we dive into another area of research, it’s important to mention the fact that you need to know your niche. Effective keyword research can be done only by knowing what your product or service can offer the potential customers and what their needs are. When a visitor checks out a site, they probably go after one specific item. However, that doesn’t mean you can’t offer them other interesting products. In case there’s a big competition in your field, they probably already rank with major keywords. Just take the opportunity to choose and borrow the ones you think will outperform others. Actually, as a company, this is the first thing we do when get you join our SEO reseller program. There’s a bunch of tools you can use to do this, but the most notable are SEMrush and Alexa. Keyword Tool is an excellent tool to help you get the keyword suggestions you want. Here are the keywords the site currently ranks for. As for more keyword ideas, you can always visit AnswerThePublic or Ubersuggest. The next huge step in a thorough keyword research is getting to know keyword metrics, such as keyword difficulty, clicks, and search volume. Traffic Potential – this one shows you the keyword’s potential to rank in the first place. You may rank for a keyword made up of 3 words, but those words can end up in all sorts of other related keywords. Their traffic potential is probably much higher than you’d expect it. Clicks – the number of clicks for a certain query is helpful when it comes to keywords with high demand, but low traffic. When you throw out the ones you see generate zero traffic, it’s easier to know which have more value. Search Volume – this factor is the overall demand for a certain keyword. Search volume can help you see how many people look for specific queries so you can tailor yours to fit your audience. To see the trending keywords in precise timeframes, try using Google Trends. The last step in doing thorough keyword research is to sort your keywords. You can either group them by the seed keyword or by broader topic. Normally, you can rank for hundreds of keywords with one page, and you don’t even have to optimise the page. Another way of sorting the keywords are grouping them by intent. When the user is looking for “apples”, he probably wants to know more than there’s to this single word. Maybe he wants to see pictures of apples or wants to know in which climates apples grow. 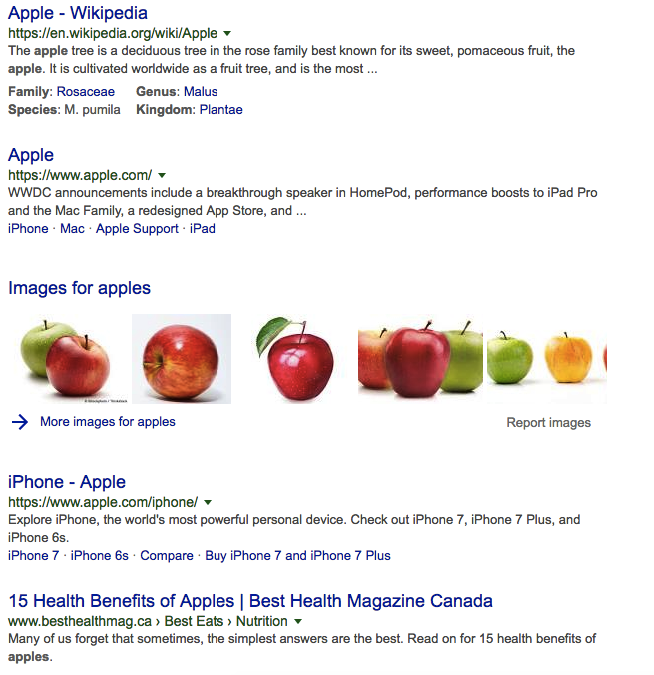 We can see that the second result brings us to the company Apple, so people obviously look for the company more than the health benefits of the fruit. After you’ve grouped them, it’s time to include them in your SEO strategy. Make sure you followed our steps to make thorough keyword research and don’t hesitate to recommend other great steps or available keyword tools! If you have a digital business, don’t waste time on doing it yourself, outsource it to us! Everything mentioned here is in the package when you use our Philippines SEO package!